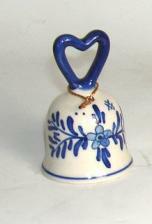 Sweet little Delft Blue ceramic dinner bell. It stands 2.5" and measures 1.5" in diameter at bottom of bell. Unique and a great gift for the collector. Made in Holland.